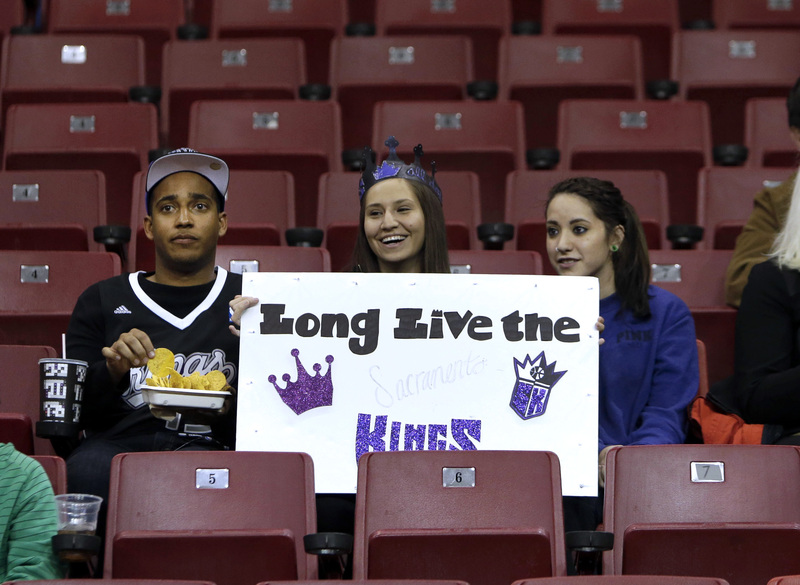 SACRAMENTO, Calif. – Thursday brought another potential snag in the sale of the Sacramento Kings to a group that would relocate them to Seattle. The Sacramento Bee reported that a bankruptcy trustee who controls 7 percent of the Kings says the team’s limited partners are being denied their legal right to match a Seattle group’s purchase offer for the team. The Bee reported that the trustee claims the limited partners have a “right of first refusal to buy the club” and that it could present a significant legal challenge in the efforts of the current owners, the Maloof family, to sell the team to the group from Seattle. Johnson made those remarks during his third straight afternoon news conference designed to publicize the efforts the city is making to save the team. Johnson said the news of the potential right of first refusal of the limited partners was not part of his strategy. But observers said there’s little doubt it could help Sacramento. “Whenever bankruptcy court gets involved, it complicates things exponentially,” said Neil deMause of the website FieldofSchemes, which tracks sports arena/stadium issues. A Seattle group led by Chris Hansen and Microsoft CEO Steve Ballmer announced Monday it had a binding agreement to purchase 65 percent of the Kings, including a 53 percent share held by the controlling owners, the Maloof family. The other 35 percent is held by four different entities, including a 7 percent share owned by limited partner Bob Cook that is in bankruptcy. The Bee reported that David Flemmer, the court-appointed trustee overseeing the share, said Cook and other minority owners have “first right of refusal” to buy the club. The Bee reported Flemmer said that right is guaranteed in the partnership agreements governing ownership of the team. The Bee further reported that Flemmer said that means the limited partners should be allowed to match the deal agreed to by the Maloofs and Hansen. Flemmer said he plans to assert the limited partners’ rights at a hearing next Thursday in U.S. Bankruptcy Court in Sacramento, according to the Bee. The Bee reported that a source close to the Maloofs said recently that the family doesn’t believe the limited partners have a right of first refusal. Flemmer is holding an auction for Cook’s 7 percent share of the team to pay off Cook’s creditors. If the limited partners are denied the right to match Hansen’s offer, that diminishes the value of the Cook share, he said, according to the Bee. Johnson is attempting to assemble an ownership group that can make what he calls a “competitive” counteroffer to the agreement reached by Hansen. Hansen’s group has agreed to pay $341 million for a 65 percent share of the team, valued at $525 million, which would be the most ever paid for an NBA team. Johnson said again Thursday during a news conference at the state capital - which also featured 11 other state and local politicians designed to indicate the wide support of Johnson’s efforts to save the team - that he hopes to unveil the names of potential big-pocket investors next week. Various reports have stated that Ron Burkle, the current owner of the NHL’s Pittsburgh Penguins, and Mark Mastrov, founder of 24 Hour Fitness, are interested in joining forces for a bid. Johnson reiterated that he hopes to have the city’s plan in place for a local ownership group to make a counteroffer, as well as a viable arena plan, by March 1, which is the deadline for teams to file for relocation for the 2013-14 season. Also speaking Thursday was California Senate pro Tempore Darrell Steinberg, who earlier in the week released a letter raising questions about the involvement of Microsoft CEO Steve Ballmer in the effort to buy the Kings and move them to Seattle given his business dealings with the state of California. Steinberg said Thursday he stands by the letter, saying he wanted to see “if there is an appropriate public policy response” to his concerns. “I just think again that there is an inconsistency between deciding you are going to partner with California on one end and make a lot of money, and at the same time you take some of that money and you use it to rip a key asset out of the capital city,” Steinberg said. Published: Jan. 24, 2013, 8:35 p.m.